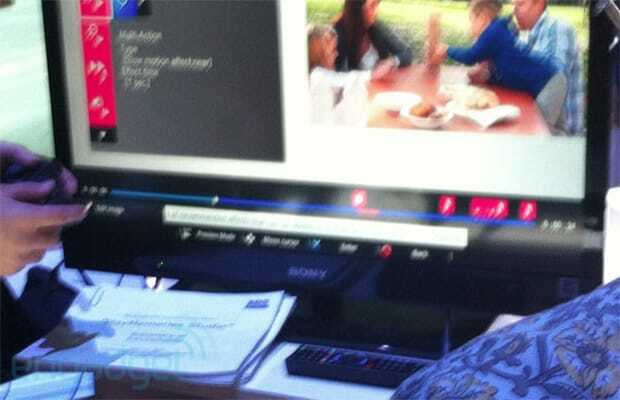 The PS3 Is Getting...Video Editing Sofware? In what seems like a drab piece of news, Sony is showing something off at this years&apos; CES called PlayMemories Studio. Some of you may be familiar with it, when someone dug up a trademark for the name filed in October 2011. Well, this seems to be it, and this blurry shot is the best picture of it in action. It sounds like PlayMemories is being marketed as a software that will interact with your Sony digital cameras and such to import the highest-quality pictures and movies to your Playstation 3 for optimal viewing. OK, OK Sony. If you tell me that this thing can capture flawless gameplay footage and switch to alternate angles, and you&apos;ll have my attention later on. It&apos;s hard to say what we&apos;re looking at [literally] but maybe, just maybe Sony is sitting on top of the most machinima-friendly software for consoles anywhere. It won&apos;t steal them an E3, or probably not even a CES, but it&apos;s hard to say what Sony has in mind here. You can head over to the PlayMemories Facebook page, which will probably be getting a considerable update once CES has concluded. What do all of you think? Would you use PlayMemories if it proved to be great machinima software?